A few weeks ago I mentioned my second grandson was in a lottery for a magnet school in North Carolina. He had to wait to see if his name was drawn out of the hat, and it was. We found out late last night. He is so excited his best friend and a girl he knows will also be going there in the fall. What a blessing for all of them. He will be studying computer engineering and hopes one day to be able to build computer games. Not much tatting has been completed this week. I have been working on samples for the Design Tat class I joined and that has kept me busy. I hope to scan the samples this evening so I can upload them to the classroom. I don't want to get behind. I also am trying to learn to needle tat. My hat is off to all of you who do. I can barely get the ds on my needle and forget adding a picot. I don't think I will master the needle, it will always be the master of me. 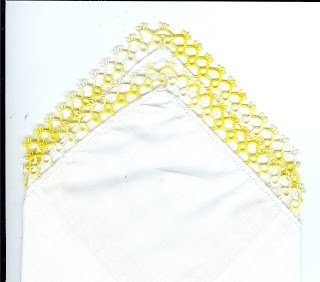 I did finish the yellow hanky edging that I lost. I attached it to a piece of linen that I had so I actually made the hanky itself. I have three more that just need to be hemmed and I can made edging to add. So many hankies what will I do with them? So glad to hear your grandson made it into the magnet school! YAY! That is very cool! 1) I'm nosy, which magnet school? I may be able to tell you about other attractions in the area of his school. I know the Piedmont area best but I know a little about the coastal and mountain regions,too. 2)I learned this from Georgia Seitz. You take 2 hankies and lay one over the other so that all the points protrude. Sew a cabone ring where the edges of the hankies cross (8 rings total). Run a cord through the rings, pulling the hankie points to the outside. Voila, you have a cute little bag.